Image above: At NASA Kennedy Space Center's Launch Pad 39A, a technician makes his way across a platform in space shuttle Endeavour's aft section as work begins to remove and replace the aft load control assembly-2 (ALCA-2). NASA space shuttle and International Space Station managers met Monday and determined that Tuesday, May 10 is the earliest Endeavour could be launched on the STS-134 mission. 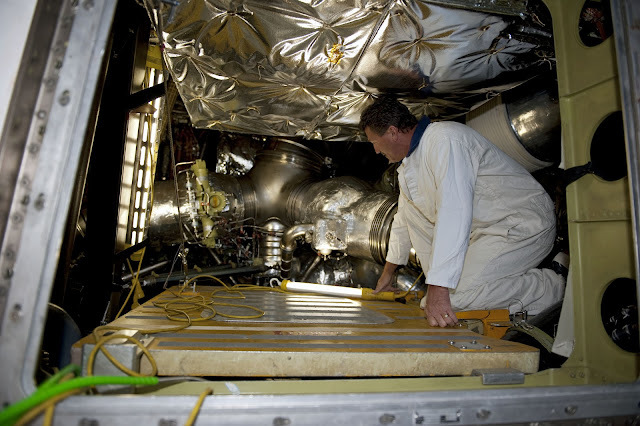 That date is success oriented based on preliminary schedules to replace a faulty Load Control Assembly (LCA) box in the orbiter's aft compartment. Plans are for managers to reconvene Friday to determine a more definite launch date after the box is removed and replaced and the retest of systems has been completed. Space Shuttle Program managers adjusted the date after further evaluating the schedules to change out the box and retest the nine shuttle systems associated with the controller. That work would be followed by the standard closeout of the aft compartment before proceeding into the launch countdown. Sunday night and Monday, technicians at NASA's Kennedy Space Center’s Launch Pad 39A conducted additional testing of systems associated with LCA-2, including testing the box itself, which is expected to be removed late Monday or early Tuesday and replaced with an existing spare. Managers will continue to evaluate the repair process and make any additional adjustments before scheduling Endeavour’s next launch attempt for its STS-134 mission to the International Space Station. The STS-134 crew is back in Houston and remains in quarantine throughout as it slowly adjusts its wake and sleep schedule to match the new launch time. While at NASA's Johnson Space Center, the crew will conduct a launch and landing simulation with its ascent and entry flight control team based in Mission Control, before returning to Florida for the launch countdown.